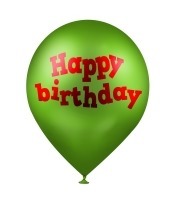 Five years ago I began this blog and am now therefore officially into my sixth year of blogging. If my blog was a small child it would be starting school! This time every year I take a brief moment to review my blog’s progress over the past 12 months and to contemplate its future direction. Over the years my blog has grown steadily to a point where it was attracting around 20,000 visitors per month. This began to spur me on and towards the end of last year when I resolved to concentrate more on my blog; writing more posts and engaging in social media more. To this aim I completely redesigned my blog’s theme (choosing to develop it on the popular Genesis Theme Framework), I began using social media (particularly twitter) much more and even started a local social media club. I also started to write posts more frequently. Ironically, shortly after implementing the theme change my blog got savaged by Google, resulting in a 50% drop in traffic! While this has undoubtedly knocked me back a bit, I remain undeterred. If breaking my neck 12 years ago didn’t stop me, then sure as Hell Google isn’t going to stop me… onwards and upwards! When I started blogging I rather optimistically planned to write one blog post a week. Needless to say this posting frequency didn’t last very long and my current posting frequency is about 1.6 posts per month (19 posts in the last twelve months). 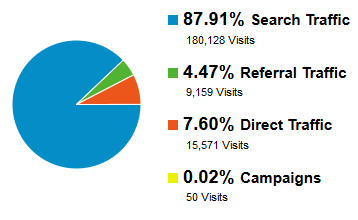 This is up a little from last year’s figure of 1.25 posts per month, so a small but definite improvement. 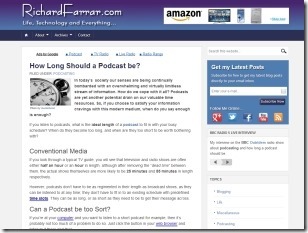 Every month I produce a podcast for my friend’s company Zen Internet which I syndicate on this blog. As such, 12 of the year’s posts are accounted for with this podcast, which means in real terms I feel that I only managed to write 7 posts during the last 12 months. I always try to write posts that are of a reasonable length and quality which will remain on the website indefinitely, therefore continuing to attract long term traffic. While these posts may take a while to write, I see them as a long term investment plan for the blog. The biggest update to my blog this year was its new theme. Moreover, rather than just recoding the style-sheet for my theme I took the bold decision to base my new theme on the Genesis Framework. This framework took a while to get to grips with, but promised a robustly coded core to act as the foundation for my new theme. While in general I’m very happy with the Genesis framework and my new theme, it appears to of had some unexpected ramifications with severe traffic penalties from Google. While I have always tried to follow Google’s webmaster guidelines in building websites that the search engine would “like”, the new theme seems to have “upset” Google. Speaking to a Search Engine Optimization (SEO) guru Matthew Woodward, he thinks my problems lay with the on-site structure (i.e. my new theme) rather than the quality of the articles or off-site links, which Google could penalize via their Panda or Penguin algorithms respectively. Clearly I’ve got some work ahead of me to try and remedy this situation. In addition to the new theme design I have also changed a few of my key WordPress plugins. The significant changes being with the website’s SEO functions and its speed optimization. For my blog’s SEO functions I used to use the All in One SEO plugin, but removed this when I implemented the Genesis Framework as it had in-built SEO functions. However, I have now stopped using Genesis’ integrated SEO options in favour of Yoast’s WordPress SEO plugin. This plugin is far more advanced, featuring social media integration (such as Facebook’s Open Graph implementation and Twitter cards), an integrated XML sitemap option and keyword assistance with SEO scoring. Using the Pingdom Tools “Full Page Test” on-line page-speed tester, I managed to get my page load times below 1 second; better than 92% of all tested websites apparently. For the majority of the year my blog performed well with a steady upward trend. Unfortunately my theme change caused disastrous consequences, dropping my overall traffic to 50% of its peak. While this traffic drop is quite frustrating, I’m determined to persevere with my new theme. I intend tracking down the source of the problem and making the appropriate changes as necessary; let’s hope next year’s review paints a better picture. Anyone who runs a blog has to deal with spam comments and unfortunately as a blog grows, so inevitably does the spam. Thankfully my blog’s Akismet and Conditional CAPTCHA plugins capture and filter the majority of the spam. The number of spam comments that Akismet caught this year were up by 70% over last year. The following graph shows the overall spam comments caught by Akismet since I started my blog. Like the majority of blog owners I use Google’s free web analytics service to monitor my website’s traffic, which supplies me with a wide range of statistical information relating to the blog and its traffic. Over the last year my blog received almost 205,000 visits with over 256,000 page views. The following graphs are for the past year, with the particular dip in recent traffic clearly visible. In line with previous years the vast majority of my blog’s traffic was brought in via search engines. Google again dominated the traffic sources accounting for 97% of all search engine traffic. The relative percentages of the different traffic sources have remained consistent with last year’s. 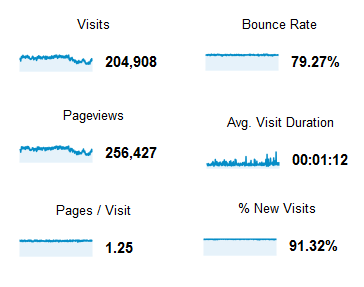 My blog is clearly beholden to the whims of Google, which has become painfully obvious with my recent drop in traffic. This is clearly something that I need to give some serious attention to, as anything that I can do to make my blog less reliant on Google has got to be beneficial in the long term. My blog attracts a fairly broad geographic audience, with visitors from 202 different countries (up 7 countries from last year’s total). 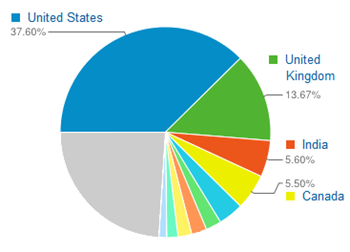 The United States and the United Kingdom combine to dominate with 51% of the blog’s overall traffic. The relative percentages of the different countries have remain unchanged over the last year however. My blog’s RSS feed continues to be supplied via Google’s FeedBurner service, which provides a useful set of statistics as well as offering the RSS feed as an alternative e-mail subscription option. However, with the recent demise of Google’s Feed Reader, some pundits are predicting the closure of the Feedburner service by Google. I do hope this isn’t the case, but only time will tell. My feed currently attracts 99 subscribers (30 of which subscribe by e-mail). This is an increase of 43% over last year’s 69 subscribers. 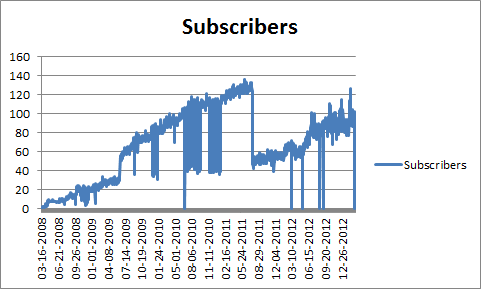 The following graph shows my RSS subscriber levels steadily increasing over the history of the blog, even with Feedburner’s erratic reporting and the sudden drop last year where they appeared to change how they reported their figures. 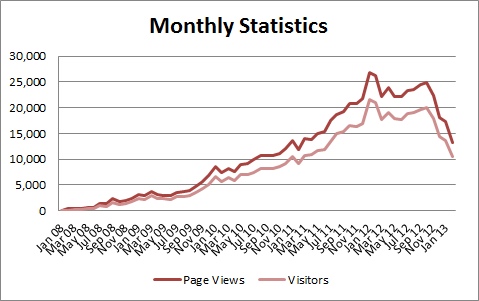 Over the last twelve months my site’s visitor numbers have increased by 11%. My blog’s most popular post is still Embedding Album Art in MP3 Files, which receives 52% of the blog’s traffic, although this has dropped down from 60%. I don’t necessarily see this as a bad thing as it’s good to have my blog traffic spread over a wider range of posts and not so heavily reliant on a single post. My top 5 posts remain the same as last year’s and in the same order, although they are all receiving a bit more traffic than the previous year, apart from the Embedding Album Art in MP3 Files, which is down in traffic by 5%. On the whole, despite my recent set-back, blog traffic is up. So if I can get over the current problems with Google and continue with my plan of being more proactive with the blog, then the coming 12 months should be positive. I intend to write more posts and continue engaging in social media more, integrating it with my blog. 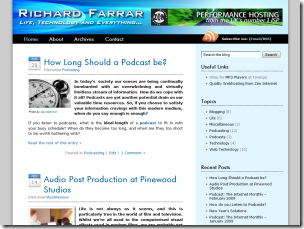 I’ve also decided to focus a bit more on podcasting. This seems to be a recurring theme on my blog, and something I really enjoy. Watch this space! Finally, thank you to all of you who have left comments, or who have subscribed to the blog.